We are among the manufacturers and exporters of high quality Chips Packing Machine. Before the final dispatch, offered machine are tested on various parameters by our quality controllers. These Chips Packing Machine are extremely demanded across the nation. We are looking for queries for Automatic Chips Packing Machine from Coimbatore , Tamil Nadu, Kerala, Karnataka & Andhra Pradesh. 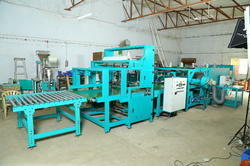 We are engaged in offering excellent quality Bundle Packing Machines. These are highly acclaimed in the market . We customize the machines catering to the Paper Industry.This Bundling Machine is available in varied models and specifications as per the client’s requirements. • High speed consistent operation.